Heroes are not always as obvious as the dedicated cop on the beat or the firefighter saving lives, and too often we forget that all men and women who willingly enter the military automatically join the ranks of heroics simply by protecting the country and risking their very lives. I've had the rare pleasure of meeting an occasional hero, one of whom I mentioned briefly in my most recent Air Force blog entry (see link list). For me, probably because I'm getting older and more impatient with my own species, my other heroes are increasingly those who speak out logically about controversial issues with which they are somehow associated. About things that we, the people, deserve to know. What follows in today's blog entry might involve heroism, but I'll let you be the judge. My previous entry about Dr. Edward Condon and the Colorado UFO study brought a highly intriguing response from former Air Force Capt. Robert Salas, a name very familiar in the credible archives of UFO research. My readers probably understand by now that I don't spend a lot of time on details offered in great depth elsewhere, so before I continue I'll strongly suggest that you visit nicap.org, one of my favorite UFO reference sites, click on the search engine and type in "Robert Salas." Several articles will become instantly available so that Mr. Salas' fascinating account as a military officer involved with a UFO event can be fully appreciated. In brief here, however, Capt. Salas was an officer at Malmstrom Air Force Base, Montana, in 1967 when UFOs began overflying the base in the evening -- and ultimately one hovered over a battery of Minutemen missiles, where it apparently knocked out both primary and back-up power, rendering the missiles useless. While Salas didn't actually see the UFOs, he was in communication with several security and operational personnel who did, and they kept him fully apprised of the UFO maneuvers. One member of the team sustained a still unspecified injury and left by ambulance. The affected missiles (up to 20, depending upon areas where additional UFO activity was witnessed) could not be made operational again until at least the next day, and evidently authorities had no idea how they were knocked out of commission. You may recall, per the book Clear Intent (mentioned in a previous blog entry), that Malmstrom and other U.S. and foreign bases experienced another encounter with UFOs likely causing peculiar instrumentation problems in 1975. As we should expect by now, the government characteristically snaked its way around that situation until its public position dictated that there was no UFO involvement. 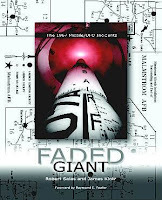 Mr. Salas has testified publicly about his base's UFO incident and also wrote a book detailing the incident with co-author James Klotz (forward by Raymond E. Fowler) entitled Faded Giant, a term generally referencing a nuclear situation. The authors spent considerable time looking up original witnesses and documentation relating to the 1967 incident, and the resulting book may be ordered through amazon.com and other outlets. 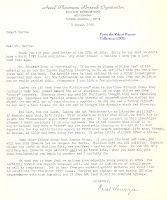 "Thanks for your info about your letter from Ed Condon regarding the 1964 Socorro incident. 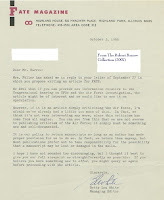 Here's more evidence that Condon whitewashed the UFO issue for the Air Force. Air Force and Condon did not want to have to investigate the possibility that this very significant event (the disabling of 20 nuclear missiles during UFO sightings) may have occurred." One wonders, as more anecdotal information of this nature comes to light about the Colorado study, what still-unknown forces simmered behind the scenes in Dr. Condon's UFO kitchen. The late (and often hilariously in error) UFO debunker Phil Klass tried to make project members Edward Condon and Robert Low "victims" of UFO proponents such as Dr. James McDonald, but it's quite obvious that the downfall of key project participants centered heavily upon scientists performing negligible science -- or no science at all. I've not re-posted visuals on this blog previously, but I am putting up my 1968 letter from Gerald Ford (see blog of June 11, 2007) again to drive home some nebulous point that deserves more clarity than I can manage here. Maybe I'm just tired of the official nonsense -- thousands of impressive UFO reports just from the U.S., plus former military personnel putting their reputations on the line by daring to go public, and so many in Congress just sitting like bumps on logs, refusing to do a damned thing to make their public testimony easier and not fraught with potential legal threats for coming forward. Sometimes, I feel that if I read one more official statement assuring us that UFOs represent no threat to our national security -- yet military personnel are forbidden under various regulations to go public with their dramatic UFO encounters because speaking out may violate national security -- I may well turn to stone. Gerald Ford? 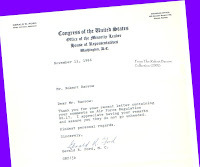 Congressman, then President, Gerald Ford, the subject of so many entries on this blog, now departed, of course. Mr. Ford, I would suggest rhetorically, knew, knew the Colorado project turned into a farce. Why didn't he do something, anything? The "UFO baby" lingered restlessly in Ford's hands since the Michigan UFO sightings, when he spoke oh SO eloquently about the need for an investigation, the once-and-forever, tell-all-at-last, absolute final word and determination. What happened? What happens to those folks in Washington whenever important UFO evidence flies into their soup? Robert Salas -- thank you for enlightening us, sir. The rest of us should always ask the question, who are the real patriots? What extraordinary measures sometimes constitute heroism? Who will offer and interpret the information we have been denied on a regular basis, and for so long, by the nameless and faceless who, though performing their duties expertly and covertly, nonetheless perform them in that sector of a free and open government intended to impart knowledge to all citizens? One needn't be a conspiracy theorist, or even a "bad" American, for gosh sakes, just to insist that our government tell the people the truth. 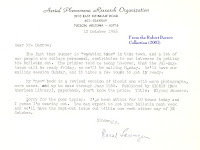 A letter from the man himself, Dr. Edward U. Condon, June of 1967. Forty years, how quickly they pass. Whatever comments I've made about the Colorado University UFO study and Dr. Condon, there is no denying his brilliance as a physicist with a colorful background and an enviable career -- and he certainly wasn't one to be force-fed government nonsense, as his history of government encounters indicates. By all accounts, he should have been a perfect choice to lead the UFO project. 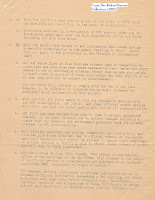 But how wrong, how horribly wrong, everything went as the project's months passed..
Those "very fine relations" with the organizations NICAP and APRO proclaimed by Condon in his letter deteriorated quickly -- particularly from NICAP's point of view, because their personnel worked a long and grueling period to provide the best UFO evidence NICAP had to offer. As it turned out, NICAP's efforts were mostly ignored by the project. 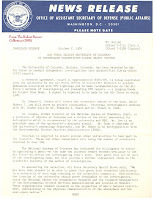 The South Hill, VA, incident of April, 1967, mentioned in the letter, in which UFO "landing marks" were evident, was briefly mentioned in the Colorado project's final report, but what amazed me most in Condon's letter was his apparent disregard for the profoundly important Socorro, NM (Office Lonnie Zamora) UFO landing case of April, 1964. The Socorro incident, impressive enough to influence Air Force UFO consultant Dr. J. Allen Hynek's opinion about UFOs, should have been a key component of any truly scientific investigation of Condon's era. 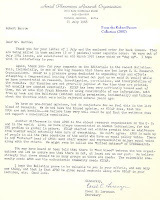 Several months before Condon's letter to me (in January, 1967, for one instance), the physicist was out on the lecture circuit making disparaging comments about the UFO phenomenon, obviously indicative of a scientist displaying a most unscientific attitude toward the subject he was charged to investigate. We, the public, expected more and deserved more, for nobody twisted Dr. Condon's arm to make him research the UFO issue with taxpayer funding. 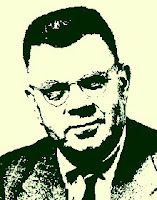 After the Colorado study report's release, Condon continued attempts to convince fellow scientists not to take a positive stand on the UFO issue. Fortunately, a substantial number of his colleagues were familiar enough with the evidence to ignore him, but despite Colorado University's sloppy and overwhelming negatively inflated conclusions, damage to the public mind had been accomplished and the usual members of the press in large part swallowed everything spoon-fed to them by the government, which was more than pleased to trumpet the Colorado report -- this, the crowbar that finally succeeded in prying the UFO monkey off the Air Force's back. UFOs were no more. UFOs were nothing special. And, oh, by the way, what about the evidence? The evidence be damned. Who cares about the evidence? After all, Colorado said. . . Colorado said. . . Colorado said. . . 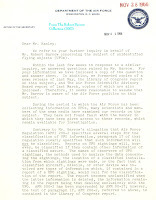 This is one of my favorites, another instance where a government official is fed up with my UFO inquiries in 1966, and probably all the more because a Congressional inquiry dictates that actual effort must be expended for a response. Well, if you're going to be dragged out and condemned, it may as well be by an officer of high rank, not just some second lieutenant. This time around, I get nailed by a full bird colonel. Pardon me if I don't get into the AFR 200-2 vs. AFR 80-17 issue again. While the colonel is correct in his views on the surface, make no mistake: These regulations (like the Navy's JANAP 146 series of regulations) effectively muzzled military personnel who encountered UFOs. The road to public relations and telling "all" involved a lengthy bureaucratic journey, not to be completed until the UFO report could be distilled into something devoid of mystery or, at the very least, something postured as easily explainable if only more information were available. The Colonel Bryan referenced was Col. J. Bryan (USAF, ret. 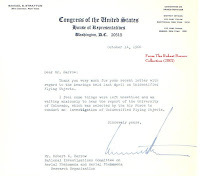 ), at that time a member of the board of governors of the National Investigations Committe on Aerial Phenomena (NICAP -- see link above), and, like Maj. Donald Keyhoe, convinced that UFOs were real, guided by intelligence and likely of extraterrestrial origin. 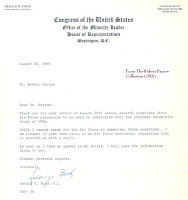 As he continued the official dismissal for my congressman's eyes, Col. Mims assures Rep. James Hanley that the Air Force's contract with Colorado University for a UFO study will provide the impartial examination needed. "This should allay any fears which he (Barrow) has," stated Mims, "about whether scientific data are being ignored." Col. Mims, of course, wouldn't realize in 1966 how upside-down prophetic those words were because, as it turned out, ignoring scientific data is precisely what the Colorado project did in the end. If I entertained any "fears," about the UFO issue, I feared the Colorado fiasco (to use Look Magazine's and author John G. Fuller's word) would turn out exactly as it did after warnings emerged from the project's own innermost circles. The title above, my play on a once popular song concerning the word, tomato, makes much ado about calling the same thing by different names, or, in this case, by different numbers. 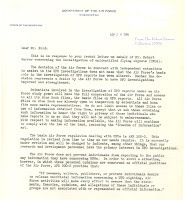 Air Force Regulation 80-17 appeared in 1966 as a replacement for AFR 200-2, that troublesome, oft-publicized (especially by NICAP) document advising military personnel about the reporting of unidentified aircraft and the like to authorities and, of more than passing interest to government officials, to the press and public. One may easily speculate that the new number varied widely from the original because officials wanted the public to forget the number 200-2, which had become known essentially as "that Air Force UFO regulation." AFR 80-17 didn't really differ that much from 200-2, but I was energized enough about it to send off a three-page letter to Rep. Gerald Ford's office in October, 1966. I think, as a teenager with unreasonable expectations, that I anticipated a little more freedom for military personnel to report UFO sightings publicly with the release of the new Air Force reg, but that clearly was not to be. Ford's office quickly signed off on my comments with a standard response, and this time the signature appears different than on previous letters. This may also be my final communication with Ford's office, but should something additional turn up I'll include it. My general policy is to contact web site personnel for permission before posting links to their pages, or to at least make them aware if I have. For whatever reasons, the gentlemen responsible for the links posted today did not respond to my requests, so I've taken the liberty of just adding them to the growing list in the margin. However, I'm always willing to delete a link promptly once notified by those who prefer their sites not appear. The National UFO Reporting Center (NUFORC) plays a valuable role in giving UFO witnesses a place to report experiences. NUFORC is often the source contacted or referenced by law enforcement personnel when they receive UFO reports. Peter Davenport keeps us current with his updates on UFO activity, and it must not be forgotten that he was really the "first contact" for information regarding the now famous Chicago O'Hare Airport UFO of 2006 (an incident legitimized in a lengthy study conducted by the scientific organization NARCAP). UFO Watchdog is a fun and informative place where you can visit the "Hall of Shame" and "Hall of Fame," regarding the best and worst of people claiming an affiliation with the UFO subject. The names you know and some you don't may well be found at this site, so if you've ever wondered about the cads and scoundrels vs. the honest and hard-working of UFO research, do not fail to pay a mandatory visit to Royce Myers' UFO Watchdog. 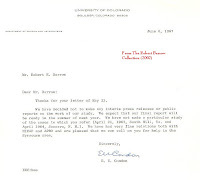 Oh yes, what welcome news indeed when the Air Force announced in October of 1966 that the University of Colorado and Dr. Edward U. Condon would get to the bottom of the UFO controversy. Unfortunately, Dr. Condon and certain members of his team became a controversy unto themselves, and the project's newsworthy undertones of mismanagement created more headlines than its eventual, deeply flawed report about UFOs. The U in Dr. Condon's middle name definitely did not stand for Unidentified. Congressman Samuel S. Stratton (NY) played a dominant role with the House Committee on Armed Services in the 1960s. 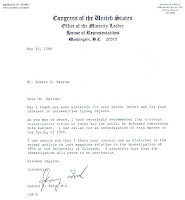 The October 14, 1966 letter displayed here references my concerns about hearings held in April about the UFO issue. Even Stratton admitted to certain aspects left hanging in the air, and like so many other members of Congress he looked forward to results of the Colorado University project. But by the mid-seventies, long after Colorado's highly questionable report -- though bulging with unsolved cases overlooked by members of the working press who had no interest beyond the negative tone and pronouncement by The Scientifically Credentialed -- UFO sightings and dramatic encounters persisted. However, few UFO incidents were as troubling as a chilling series of incidents at several U.S. (and some foreign) military bases in 1975, covered superbly by researchers Larry Fawcett and Barry Greenwood in their book, Clear Intent. When I reviewed this book for the defunct journal Pursuit, I used considerable page space quoting from it, as it was and remains one of the best books about UFOs ever published. For much of the rest of today's entry and its relationship to Rep. Stratton, I'll reference the work of Fawcett and Greenwood. I urge you, the reader, to find a copy of Clear Intent and discover the dangers inherent in avoidance of a still-unrealized thorough scientific UFO investigation. Parade Magazine (the weekly newspaper insert) on December 10, 1978 broke a story based upon government documents obtained via the Freedom of Information Act. The article disclosed several instances in 1975 of UFOs overflying and hovering low over key military facilities such as Loring, Malmstrom and Wurtsmith Air Force Bases. Further, the strange objects would hang directly over essential weapons systems at these SAC bases, including missile sites and launch control facilities, possibly affecting instrumentation. Base personnel were powerless either to intercept or communicate with the intruders. "The attached item from Parade magazine of December 10 reports that unidentified aircraft penetrated the airspace at several Strategic Air Command bases in the United States and Canada on several occasions during the period October 27—November 19, 1975. The article proceeds to quote from Air Force documents to the effect that the intruding aircraft had "a clear intent in the weapons storage area" at Loring Air Force Base. Those same documents reportedly refer to unsuccessful efforts of Air Force air-crafts to intercept and identify the intruder aircraft. This Subcommittee is concerned by the alleged ability of unknown aircraft to penetrate airspace and hover over SAC bases, their weapons storage areas, missile sites, and launch control facilities, and the inability of Air Force equipment and personnel to intercept and identify such aircraft. Accordingly, it is requested that all Air Force reports relating to each of the incidents described in this article be furnished to the Subcommittee. It is further requested that all reports of any similar incidents, either before or since the October-November 1975 events, be furnished to the Subcommittee." Apparently, various Air Force divisions seemed unaware of the incidents mentioned, and in one instance the USAF Directorate of Operations and Readiness stated on January 8, 1979: "We have been unable to find any official information regarding the incidents described in the Parade magazine article. Contact with individuals assigned to operational units where the incidents were alleged to have occurred indicate some of these incidents may not have happened at all." 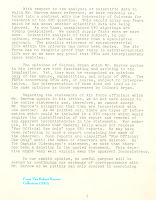 "This is in response to your recent letter concerning an item from the Parade magazine of December 10, 1978 regarding unidentified aircraft penetrating the airspace at several Strategic Air Command bases in the United States and Canada on several occasions during the period October 27 through November 19, 1975. Attached is a partial compilation of available materials obtained in response to your request for Air Force reports pertaining and similar to the incidents described in the Parade magazine article. We have requested such reports from numerous Air Force organizations, some of which are outside of this Headquarters. Not all of this material has been received, and it will be forwarded when it becomes available to us. Please note that the attached material rarely includes formal reports as such; rather, it mainly consists of copies of documents such as messages, memoranda, and duty officer log entries. This is because unidentified flying object reports are of transitory interest to the Air Force and permanent files are not maintained. In addition, please note that much of the enclosed material has been released to various people and organizations under the Freedom of Information Act. We trust the information attached will be helpful and hope to get additional information to you as soon as possible." "Any hopes that a Congressional hearing might have been convened were dashed because Stratton did not pursue the matter after receiving the Clark letter and attachments. Why? He pressed for various measures to close off the flow of information from the military to the public and even urged substantial penalties for those who might print more than what the Pentagon would allow them to print. "Under these circumstances, it's obvious why Stratton said nothing more of the 1975 incidents. He avoided all attempts by investigators to contact him in his office, and no statements were given. His interest in 1975 is quite understandable, as any heavily pro-military person would be concerned over the Air Force's difficulty in dealing with the UFOs. "The fact that some individuals managed to locate specifics about the sightings was a necessary evil that the Air Force had to live with. The hope was that the small number of people who had this information would not have enough of a voice to draw attention. This worked until Parade picked up the baton. "Fortunately for the Air Force, Stratton was the only Congressman who asked weighted questions. He was friendly to the military and would not make waves. Politics did not enter into the 1975 picture in a serious way hereafter. The ball was definitely back in the court of the UFO researchers." Curious, isn't it? Just as public officials who speak openly about UFOs become strangely silent about the subject once they become president, more than one member of Congress has assumed the same stance once the, shall we say, heat increases in the UFO kitchen. So, dear reader, for today I give you the UFO-investigative legacy of former NY Congressman Samuel S. Stratton. Be not proud of this, one more feeble congressional attempt to tell the people the truth without actually delivering the truth. Next? 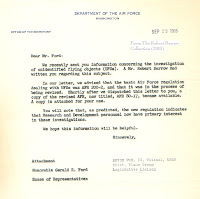 This Air Force response about UFOs, yet another, was sent along by Congressman Gerald Ford in 1966. Believe it or not (I know you will), I have even more from Gerald Ford's office and will offer something next time around. Today, it's a grab bag of old correspondence, probably more meaningful to me than to you. 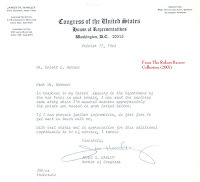 Apparently, Sen. Robert Kennedy's office sent me something in 1966, perhaps a transcript of congressional UFO hearings, though I don't recall. Here's a note attached to whatever it was. Say what you want about Fate Magazine, but it's a survivor, still publishing decades after its start. As the editorial office letter indicates, I wanted to write for Fate. I actually did write a piece, submitted it and -- the story of my early writing life -- was promptly rejected. Finally, here's a great old letter from the editor of the former Syracuse Herald-Journal, giving me permission to use something -- doubtless, for another hopeless article I submitted to some poor editor with better things to read than my teenage ramblings. 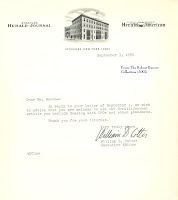 At any rate, I love the letterhead with the illustration of the old newspaper building. Long ago, the Syracuse dailies, owned by the Newhouse Co., moved into a sprawling new facility and imported an elaborate state-of-the-art printing press from a foreign country. In the interim, the afternoon and evening Herald-Journal and Sunday Herald-American were dropped , and all daily editions now bear the name of The Post-Standard, originally the morning newspaper distributed by the company. While my letters to the editor about UFOs appeared in all three newspapers in the sixties, my very first saw print in The Post-Standard in the summer of 1965. Some kids find their first thrill on the baseball diamond, hitting that initial home run, while others glow over catching their first fish. And still others reject all of that, discovering instead that nothing, but nothing, beats the first time you see your writing and name on the printed page. As I continue to find more 1966 correspondence to and from the office of Gerald R. Ford, House minority leader and future president, I sometimes wonder whether his staff had realized they were putting all of this effort forth for a teenager who couldn't vote, not to mention I was not a Michigan resident. Then again, as minority leader, I suppose his office routinely accommodated the nation. This issue of voting districts does raise a sore point with me. 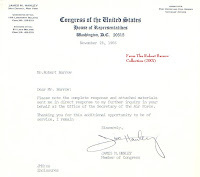 Back in the day, when I often wrote congressional members all over the country, each and every one of them responded in writing. These days, should a writer not be eligible to vote in their district, they frequently refuse to reply or they send you a form letter stating that "congressional courtesy" requires your correspondence be forwarded to your own representative. Congressional representatives in alarming numbers seem to have forgotten that they work for all U.S. citizens, not for just the few held dearest merely because they either vote locally or (a bigger problem yet) they contribute tons of campaign money. But why belabor the obvious? This time around, an Air Force Colonel responds to Mr. Ford on my behalf regarding Air Force policy, and there are no surprises here -- unless one raises an eyebrow over the officer's apparent policy of not signing letters directed to members of Congress. How peculiar, though. I'm inclined to end today's entry with the words, Quoth the raven. . ."Nevermore." Dr. Leon Davidson, a chemical engineer with a very interesting government history, died earlier this year, but in the fifties and sixties he was known particularly for his UFO research work. Aside from bringing out the worst of the CIA, when the agency responded to his UFO-related queries in ways worthy of a cheesy Saturday movie melodrama, unwittingly creating a conspiracy that didn't exist, Davidson is important in another respect. In 1956, with no opposition from the U.S. Air Force, Davidson published 1,000 copies of his work, Flying Saucers: An Analysis of the Air Force Project Blue Book Special Report No. 14. He followed this with another 1,000 copy run in 1957, and in 1966 a commercial publisher, Ramsey-Wallace, put out 2,000 more copies. Project Blue Book's Report No. 14 is a favorite of physicist and UFO researcher Stanton Friedman, who often makes the point that 21.5 percent of well over 3,000 cases referenced in that report remain unidentified -- and that's in addition to another 10 percent of cases slipped into the "insufficient information" category. That's a pretty hefty number from a government which claims eternally that UFOs are not a threat to national security, nor of any particularly enigmatic substance whatsoever. 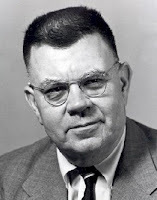 Dr. Edward U. Condon, who headed up the Colorado University UFO study (as mentioned previously, almost a third of even those reports remained unidentified) conveniently overlooked the implications of Report No. 14 as his own project careened toward a brick wall of controversy. I'm not sure, but I suspect written communication from Dr. Davidson is a bit rare in the UFO community currently, so in the interest of history I'm posting his 1966 note to me about his work. I'm not sure exactly what issue relating to his monograph we were corresponding about, but I'll just submit the note and leave it at that. Read more about Dr. Leon Davidson at NICAP, CUFOS (see links above) and other legitimate web sites via a Google search, where I suggest you type in: leon davidson ufos to avoid others with similar names. 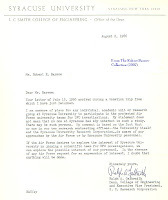 During the summer of 1966, enthusiastic about the Air Force contracting for a UFO study with an institution that eventually turned out to be the University of Colorado, I wrote Syracuse University to inquire whether S.U. would have a role in any aspect of the project. I think my curiosity arose because, from time to time, a member of the Syracuse University Research Corp. would contact me with questions about UFOs. Yes, the inquiry was a shot in the dark -- and the reply from the dean of engineering far more than I anticipated. Still, I was overwhelmed by his candor and nonchalant attitude toward university participation in a UFO study, if requested. Remember, these were the sixties, and maybe college kids were wearing flowers in their hair and practicing "free love," but I would wager that openness about scientific UFO investigations in many university settings might have been a phenomenon in itself. But what if Syracuse or some other university saturated with an impressive array of scientists had acquired the Air Force contract instead of Colorado, treating UFO research fairly rather than inviting condemnation? How would our lives and academia have changed with a university announcement that UFOs represent a legitimate scientific mystery, desirous of an extensive investigation? At the very least, wouldn't it be great to turn back the clock and watch a team of university professors proclaim that some thirty percent of the UFO cases submitted for study actually remained unidentified (as they were via Colorado's project, despite the absurd negative results), thus supporting the conclusion that the anomaly deserves research, not derision or a negative conclusion? Because I was unable to post three book covers as a sampling of Jim and Coral Lorenzen's books about UFOs in the previous entry, here they are. The first was Coral's The Great Flying Saucer Hoax, a hardcover released in the early fifties, later published in paperback. UFOs Over the Americas and Encounters With UFO Occupants were paperbacks published in later years. If you read my tribute to Coral Lorenzen (in an earlier blog entry), who started the now defunct UFO organization APRO (Aerial Phenomena Research Organization) with her husband Jim in 1952, you know how much respect I had for them. They are deceased. History must also come to grips with the fact that Coral, like women who have come so far in traditional areas of employment and education over the years, was a woman who truly sparkled in the UFO research area. That's not to say there aren't others, for there are, but Coral was a pioneer among the women of UFO research, and because that troublesome term, "UFO" enters the stage, gaining the respect and acceptance of her name and accomplishments in traditional society will be a slow process. You should also know -- if you are as unfamiliar with Coral as I think you are because, frankly, a lot of the older UFO researchers are dead now, so I'm assuming most of my readers are new to the UFO subject -- that she had her enemies. Well, maybe enemies is too strong a word. What I should say is that some people in the UFO "field" plain, flat-out disliked Coral, and she didn't particularly care for some of them. No, I don't want to start parading out names. I have entitled this entry as I have because if she didn't like somebody, Coral "took no prisoners." She didn't nice-up the circumstances, instead saying what was on her mind about people. If you did something to incur Coral's displeasure, she remembered forever. She told it the way she saw it. In a world where so many people wear two or more faces, I think she only had one, and I appreciated her all the more for her honesty and integrity. For her moral sense. We had phone conversations from time to time and she would tell me things about various UFO "personalities" and the dirt and baggage they carried that would amaze. One time, she related something of such a bizarre nature with potential implications for a member of the scientific community that I'll be taking it to my grave; it isn't something anybody needs to know. Nor would the likely inevitable lawsuit for fostering a "rumor" appeal to me. In fact, you'll find it not uncommon at all for folks who have spent any time looking into UFO reports to harbor secrets, because some things are both told and consequently then held in strictest confidence. But, you'll ask, well, if you're not telling, why mention it? I mention it because I want to emphasize that after a time, once Coral and I spoke or wrote on a first-name basis -- unlike the early letters posted here, where she addresses me as "Mr." -- I knew we could trust one another's judgment, and she was truly a friend via correspondence and the occasional phone conversation. Was I an inner circle-type friend? Good grief, no. I never met Jim or Coral personally, and I'm sure my relationship with them merely equaled that of numerous other APRO associates. Yet, they did arrange for me an entrance into the world of writing for national magazines, so how does one gauge degrees of friendship on that incredible basis? I think a substantial number of problems Coral and other researchers encountered with one another in an area already rife with jealousies concerned a perceived unwillingness of APRO to share UFO information, whereas much of the disagreement came about because APRO wished to protect information and witnesses -- and, obviously, Coral had the right to include results of APRO's investigations in her books and A.P.R.O. Bulletin issues, if the only other option was for unscrupulous writers or so-called investigators to steal the documentation for their own purposes. Oh yes, Coral knew the UFO arena well, and no less the factions recognized for pitching intellectual circus tents of every enticing, deceitful and just plain crazy color imaginable. Today, we'll post four letters from Coral Lorenzen. Actually, one is a snippet that she typed and returned on a letter I had sent her regarding permission to use various APRO items in something I was writing for eventual publication (a project I abandoned). Here, she makes reference to the Lorenzens' close friend, the late Dr. Olavo T. Fontes, a physician and prominent Brazilian UFO researcher whose writing and work has long been quoted in international UFO literature. In yet another letter, Coral delineates the reasons why she believes the organizations APRO and NICAP are so different in their approach to UFOs -- yet each so necessary in its own way. Though she takes great care to say she isn't condemning NICAP's UFO goals, well, she is offering criticism. But the generally unspoken, and even denied, rivalry between NICAP and APRO was never a secret anyway. However, as another letter shows, Coral was hardly a fan of veteran broadcaster Frank Edwards. In this instance, she takes him to the UFO woodshed for several errors he allegedly made in reporting about the 1964 Socorro, New Mexico UFO case (patrolman Lonnie Zamora's encounter with a landed object and apparent small figures). Edwards, affiliated with NICAP, was a veteran broadcaster, for many years with the Mutual Broadcasting System, who gained national notoriety by both speaking and writing about UFOs. I loved his early paperback book, My First 10,000,000 Sponsors, about radio's early days and his days in early radio broadcasting. Obviously, Coral rakes Edwards over the coals about Socorro, especially because she and Jim were on the scene within hours after the incident and knew the details well. Nevertheless, while it's not up to me to defend Frank Edwards, who performed a monumental service in the fifties and sixties by alerting the public to government UFO policy and dramatic reports, I will make one point. Unlike Coral, who was a seasoned writer with time to research her cases thoroughly before writing about them, Edwards was brought up in the broadcaster mode: Get the story, pow, get in and report it, pow, then get out and go on to some other piece of news because radio's time constraints wait for no one. Given the choice, I think Frank Edwards would find the truth and nothing but the truth preferable to tidbits thrown together, but, again, precision and intricacies played a small role in his radio days. There just wasn't time, and the writing in his books reflected the same background. Of course, Coral didn't see things that way when conjuring up Frank's name! There will be more about the Lorenzens and APRO presented here. The organization is no more and its invaluable files are with people I don't know. The disposition of APRO's extensive global case files has been a source of controversy for years, unfortunately -- unlike, conversely, the matter of NICAP's files which, to everybody's good fortune, now belong to the J. Allen Hynek Center for UFO Studies (CUFOS). In the next blog entry, I'll include three Lorenzen book covers, a sampling of several books Jim and Coral wrote about UFOs. In Encounters with UFO Occupants, they were kind enough to list each and every one of their field investigators, including yours truly, state by state and country by country, in way of thanking us for being a part of APRO. In many ways, as Coral flatly states in one of the letters shown here, APRO's international connections really did make the organization something akin to "the United Nations of UFO research."